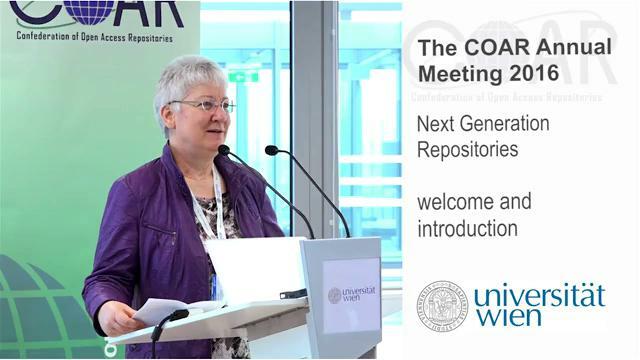 COAR Annual Meeting and General Assembly 2016: "Next Generation Repositories"
Herbert Van de Sompel: "Establishing new levels of interoperability for web-based scholarship"
Pandelis Perakakis: "Validation, Evaluation, Dissemination: Academia’s gravest problems show the way to the Next Generation Repositories"
Maria Seissl ist Leiterin der Dienstleistungseinrichtung Bibliotheks- und Archivwesen der Universität Wien. Herbert Van de Sompel ist Leiter des Prototyping Team an der Research Library des Los Alamos National Laboratory (New Mexico, USA). Pandelis Perakakis ist Postdoktorand an der Universität Granada sowie Direktor und Mitbegründer von Open Scholar. CC BY-NC 4.0 - Creative Commons Attribution-NonCommercial 4.0 International License. o:441244 COAR Annual Meeting 2016: "Next Generation Repositories"